Today, 6th February, is the 13th annual International Zero Tolerance to Female Genital Mutilation Day. To mark this milestone the Morning Star asked me to write a piece in response to the question, ‘Yes, that’s good; but what are we as ordinary citizens actually supposed to do about it?’. I hope that the suggestions I shared (below) help to move forward on that very important matter. On 6 February 2003 Stella Obananjo, then spokesperson for the Campaign Against Female Genital Mutilation and First Lady of Nigeria, declared that delegates had reached consensus on the abolition of female genital mutilation (FGM). At a conference organised by the Inter-African Committee on Traditional Practices Affecting the Health of Women and Children (the ‘IAC’ – also founded on 6 February, in 1984), Mrs Obasanjo announced that 6 February would henceforth be observed annually by the United Nations as the International Day of Zero Tolerance to FGM. Later events such as the Maputo Protocol (an African Union agreement, later in 2003), the Bamako Declaration (IAC, 2005) and the United Nations Declaration (Commission of the Status of Women, 2012) have reaffirmed this steadfast determination of traditionally practising communities to have done with FGM. It was the first inklings of this message a decade ago that prompted my own small contribution to campaigns against FGM – a textbook finally published in late 2015: Eradicating Female Genital Mutilation and then, in early 2016, another book, Female Mutilation, which contains dozens of narratives (stories and case studies) from people around the world who are survivors, campaigners, communities and professionals with a concern in this field. 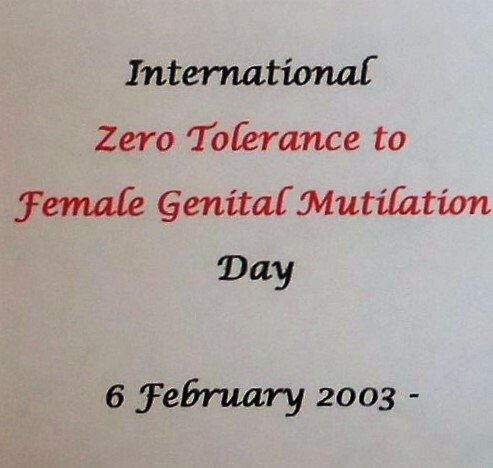 And so on Saturday 6 February 2016 we celebrate the 13th annual Day of Zero Tolerance to FGM. FGM will only become history when and if we all insist that it must do so. Eradication costs money, demands political will and is dependent on skillful planning. As electors, we have a duty to keep the prevention of FGM and other child abuse at the forefront of political thinking. FGM – indeed, all child abuse – also requires vigilance by everyone on behalf of those who may be at risk. We all need to know what must be done if a child (or woman) in our community may be vulnerable. That means insisting that local services – schools, clinics, police and so forth- are prepared and equipped to keep vulnerable people safe. FGM will only stop when better ‘alternatives’ are genuine prospects, and widely perceived as on offer. Where girls and/or their parents believe that bride price and early marriage is the best way to adulthood, FGM will continue. People in traditionally practising communities, whether in original locations or the diaspora, must know that education and, as adults, employment and economic autonomy, are available to girls who would otherwise experience FGM. Propagating this message is one of the several ways, alongside safeguarding their sisters and friends, in which young people in traditional communities can help each other. Our duty as citizens is to ensure these promised future prospects are valid and delivered. FGM is hugely harmful to women’s health and also adds considerable risk obstetrically; but even in the UK many women who have undergone FGM remain unaware that FGM is a cause of their ill-health. We need, however we can, to ensure that information – alongside a parallel insistence that help is made available to those who need it – reaches both FGM survivors who need support and, via suitable teaching, all children in school, who must also learn where girls at risk can go for safety (and the rest of us must make sure such provision is available). FGM is still a significant risk to young girls in some families where it has traditionally been practised. It is important that the issue is always addressed where a survivor has daughters, sisters or other potentially at-risk children. The default position for those who must raise the matter should be that mothers (and fathers) are presumed to be allies in ensuring their daughter comes to no harm – but with the caveat that everyone knows permitting FGM will have very serious consequences. Our job as citizens is to make sure that is the case. But still at every turn we encounter obstacles. The relativist argument – we can’t ‘interfere’ with other communities’ or nations’ ‘customs’ – was until recently maintained by some who now regret that stance. During 2010 the then-Labour Government introduced a nascent national FGM Unit to tackle UK problems, but in 2011 the new Coalition Government closed it (it was reinstated in late 2015). Later, we were told that FGM won’t stop in Britain until it stops in ‘Africa’. And it is only recently, as the Statement on Female Genital Mutilation insists, that people have understood how euphemisms (words like ‘cutting’) in formal contexts avoid the hard truths which must be confronted if FGM is to be eradicated…. And so it goes on. February the 6th, the International Day of Zero Tolerance to Female Genital Mutilation, reminds us powerfully that this brutal abuse of human rights, the ultimate in patriarchy incarnate, must end. No-one need stand aside. The prevention of FGM is something in which, in our own ways, we can all help to achieve. ← A Global Paradigm For ‘FGM Studies’?